Ian Everest’s talk, illustrated by old photographs and cine film, will offer insight into some of the less well-known aspects of life in the Ouse valley between Lewes and the sea. Areas of interest will include the agricultural, industrial, aviation, sporting and artistic heritage of the area. Muggery Pope, Mount Misery and the sport of kings – all will be explained! Ian’s interest in the history of the Sussex countryside dates back to his childhood, which was spent living on the thousand acre downland farm on which his father worked. His great-grandfather had moved to this area as a farm labourer in the late 1880s. In his teenage years, Ian worked on farms in the Ouse Valley before attending Plumpton Agricultural College in the late 1960s. After further practical farm activity, he worked at a farm animal-disease research centre before entering into farming related commercial activity. In 1987 he had a change of direction when he became manager of Newhaven Fort and prepared the scheduled monument for opening to visitors the following year. He later became town clerk of Newhaven. Prior to this he had started researching his family history and this on-going activity led to the development of a number of Sussex local history talks. 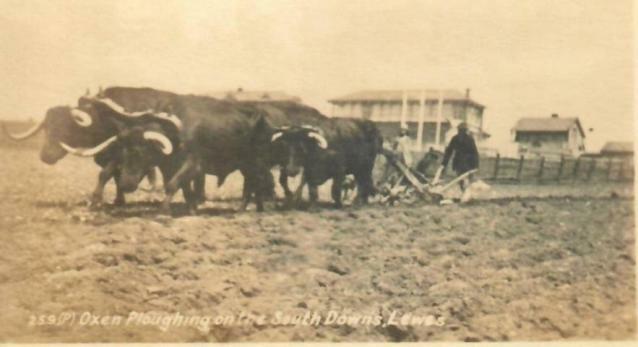 This early postcard shows a ploughman with a team of four oxen at work on the Downs, with the racecourse in the background. It was offered for sale on ebay in 2016, and sold quickly, after very competitive bidding. Thomas Harben was apprenticed to the Lewes clockmaker Thomas Barrett in June 1724 at the age of 14, and later established his own business in Cliffe. He died in 1766. His longcase clocks, with his name and ‘Lewes Cliffe’ or ‘Cliffe Lewes’ engraved on the dial turn up from time to time in specialist shops such as W.F. Bruce, North Street, or in auction houses. 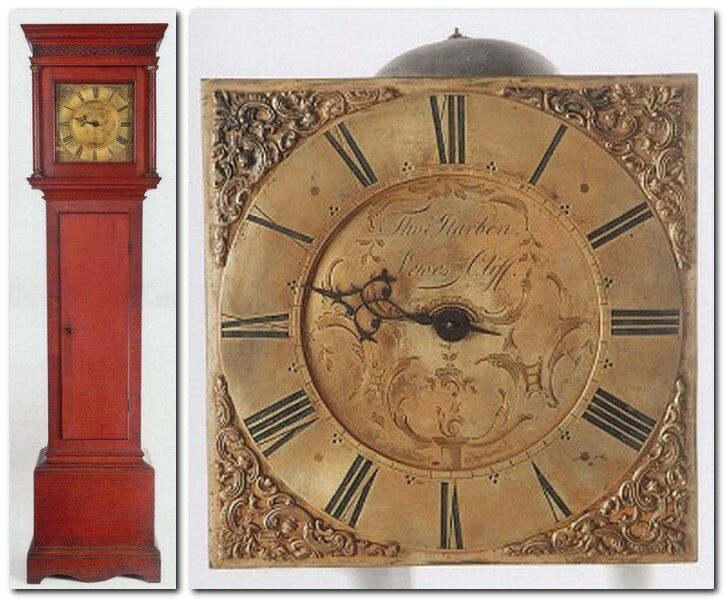 One of his longcase clocks, six feet tall, is illustrated on the website of a Massachusetts specialist dealer, Delaney Antique Clocks, as an item they have sold. Thought to date from the first half of the 18th century, it had only an hour hand – minutes were perhaps not so precious in those days. It is fairly described as a country clock, with a case of elm. His son, also Thomas Harben (1739-1803), was also a clockmaker early in his life, but by 1764 was described as a ‘watchmaker and silversmith’. In 1782 he went into partnership with Thomas Pelham and Bannister Flight to form the Lewes Bank [see Bulletin no. 70], and later the Brighton and Horsham Banks. The second Thomas Harben prospered and acquired landed property in the areas around Lewes, especially in Seaford. His intention was to build up political interest there, and he built a prominent house called Corsica Hall, reputedly with materials from another house of that name in Wellingham, Ringmer. His bank succumbed to a run in 1793, although he was eventually able to honour his obligations after the sale of his properties. The Lewes auctioneers Verrall & Son placed an advertisement in the 22 July 1793 Sussex Advertiser for a sale by auction that they were to hold on the premises of the late John Wimble junior on Monday 5 August and the following days. The sale was to begin each day at 10 o’clock in the morning. He was the son of John Wimble of Lewes, ironmonger, and the half brother of Nehemiah Wimble, who was also an ironmonger and later lived at The Friars. John Wimble had been planning to establish himself in Lewes trading as a country brazier, but had died before he could put his plans into effect. His executors had therefore ordered the stock in trade that he had already accumulated to be sold off, along with his household furniture and effects. Probate of the estate of John Wimble of Lewes, coal merchant, was granted on 1 February 1793, in accordance with his 21 April 1792 will [ESRO PBT 1/1/66/596]. He died within the lifetime of his father, another John Wimble, ironmonger, and his estate was valued at £1,000. He had established himself at 190 High Street, using the rear of the premises as his coal yard [ESRO HIL 6/83]. His intended stock in trade was described as brazier, tin, pewter, ironmongery, and other articles as usually sold by country braziers. The description of his household goods was more detailed. Items for sale included fine goose and other feather beds, with printed cotton morrine and other furnitures; blanketts, counterpanes and quilts; pier and dressing glasses in mahogany; chairs; every sort of tables; chests of drawers, wardrobes, a desk and bookcase; a sofa; register and other stoves; an eight day clock in a mahogany case; Wilton and Scotch floor carpets; household linen; glass, china, delft and Queen’s ware; and kitchen, brewing and washing utensils. 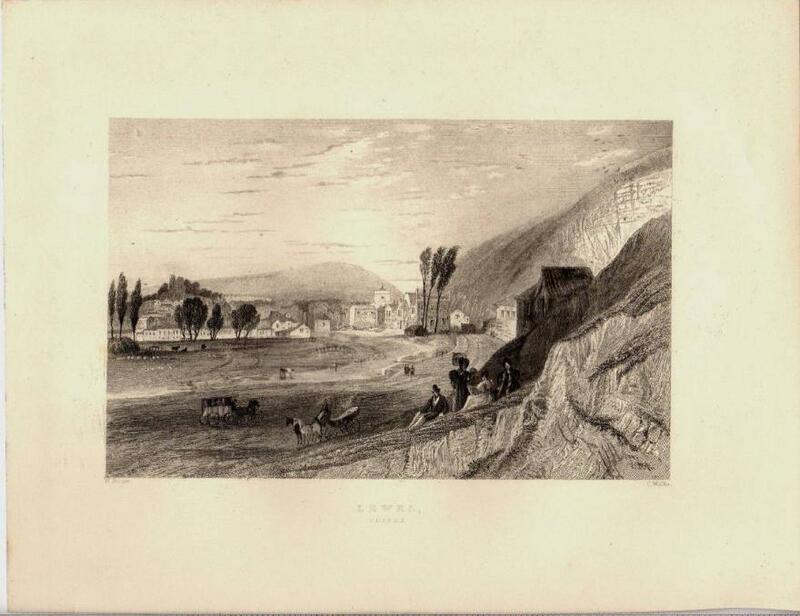 This Victorian engraving, by Purser & Wallis, shows vehicular traffic approaching and leaving the town. Wharf House and St Thomas’s church in the Cliffe can both be made out. John Geall recently loaned me a copy of ‘Traffic in Lewes’, a report produced in July 1969 by Hugh Wilson & Lewis Womersley, Chartered Architects and Town Planners, in conjunction with the consulting engineers Ove Arup and Partners. 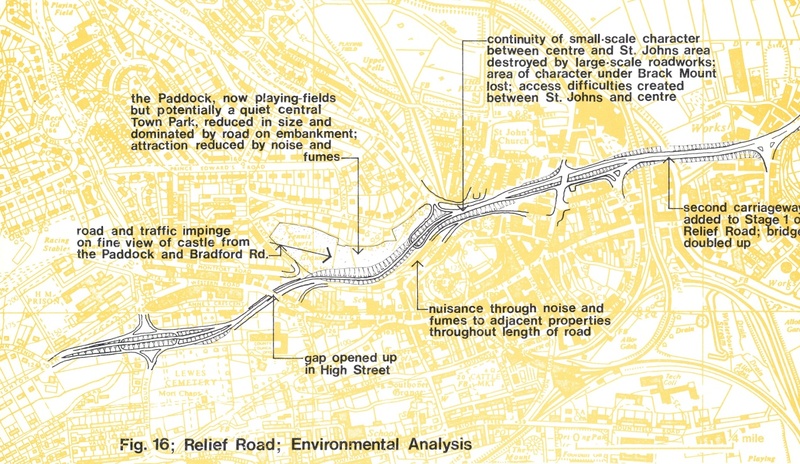 The report was commissioned as a result of the campaign against the East Sussex County Council proposals for the Inner Relief Road by the Friends of Lewes, the Lewes Traffic Study Group and others, most fully described in articles by Jim Franks and Graham Mayhew in ‘Lewes 1952-2002’, published by the Friends of Lewes. As many members will be aware, at that date the County Council had identified that Lewes was being strangled with traffic, mainly from the A27 which made its way past the prison, down Lewes High Street (where the Bottleneck was no help) and Cliffe High Street, and then turned right at Cliffe Corner, to travel along South Street to Southerham. At Cliffe Corner it was joined by the A26 running south from Uckfield. Despite the best efforts of the traffic officer on duty there, there were continuous rush hour traffic jams along South Street, Malling Street and Cliffe High Street. The report was illustrated with photographs to make the point. Traffic in the High Street at 5.40 p.m.
As the expert forecasts were that traffic was likely to double, and then double again, it is hard to argue with the County Council conclusion that something had to be done. The question was what. 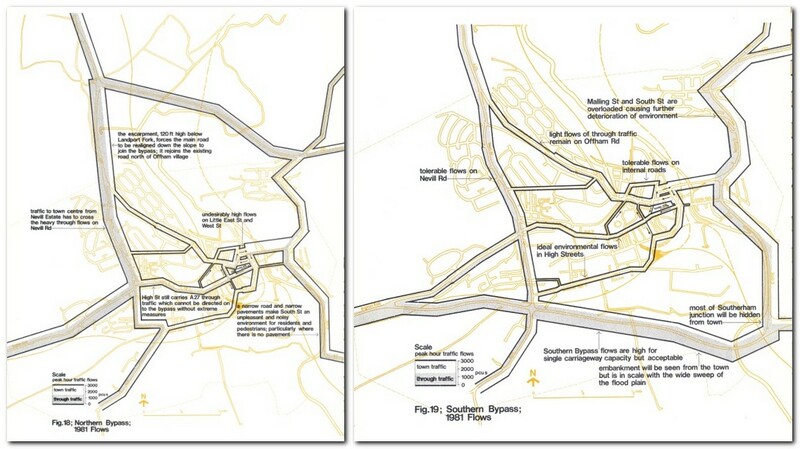 The Ministry of Transport had plans for a southern by-pass from Southerham to Hope in the Valley, but they had no date attached, and were not expected to materialise in the next decade. The County Council did not believe Lewes could afford to wait. Its preferred solution was to drive an Inner Relief Road through the heart of the town. Indeed, it was already completing the first stage of its new road, Phoenix Causeway. It was the rest of its route that was controversial. It planned to drive its new road over Little East Street, bulldoze most of St John Street, part of Sun Street and Whitehill, build a huge embankment along one side of the Paddock, and then burrow under the High Street near the entrance to County Hall, skirt St Anne’s Terrace and join the Brighton Road at the west end of the Prison. As the consultants pointed out, there were many environmental downsides to the proposal. Following the report, the idea was abandoned. The consultants also considered a northern by-pass from Earwig Corner to Offham (surely an Aunt Sally, as it wouldn’t help the A27 and traffic would just pile up at the Prison crossroads?) but favoured a southern by-pass. They thought the idea of a Cuilfail tunnel “attractive but very expensive”. This entry was posted in Agricultural History, Lewes, Local History, Social History, Transport History, Urban Studies. Bookmark the permalink.